Steeped in history and arts, Orange is world famous for its extraordinary cultural heritage. It was founded in the territory of the Gallic tribe the Tricastini in 35BC by veterans of the second Gallic Legion, and was then known as Colonia Julia Secundanorum Arausio. Located in the lower part of the Rhône valley, it is separated from the areas around Vaison la Romaine and Nyons by low hills. 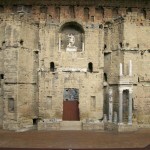 Orange’s famous ancient theatre – a UNESCO world heritage site – was built at the beginning of the Christian era. 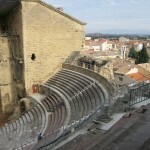 A remarkable monument, it is the only Roman theatre in Europe with its scaenae frons still standing (103 meters long and 36 meters high) and lies across the Saint-Eutrope hill. 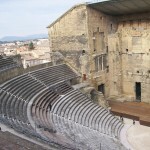 Regularly welcoming thousands of spectators for a variety of productions, it now hosts the Choregies d’Orange, internationally renowned plays and orchestra concerts taking place in this unique theatre.